When it comes to landscaping services for your residential property, Tuff Turf, Inc. is the only name to trust in Merriam, KS. When it comes to landscaping services for your residential property, Tuff Turf, Inc. is the only name to trust in Merriam, KS. We take pride in offering remarkable landscaping, lawn and tree care services. Take a look at the detailed list of our services to get an idea about our work. Bed Maintenance- All landscape areas will be maintained every week to ensure weed free beds. Sidewalks and driveways can be weed free with applications of hard surface weed control. We recommend that mulched beds be top-dressed twice a year to maintain weed control and an aesthetic appearance. Aggregate (rock) will be maintained at depths of two to three inches with a barrier fabric underneath. Core Aeration- This process, if plugging holes into the turf, promotes stronger root growth and deeper water penetration. The plugs allow micro-nutrients back into the soil and help prevent thatch build-up. We consider this one of the most important processes in maintaining a strong turf. Irrigation System Service- Our team of professionals can design and install sprinkler systems for commercial and residential properties. Prompt service is provided for repairs and backflow certification on all systems. Activation and winterization services are also available. Landscape and Hardscape Service- We offer landscape design and installation, mulch and stone work including patios, stone walls, walkways and borders. We also do grading and sod installation. 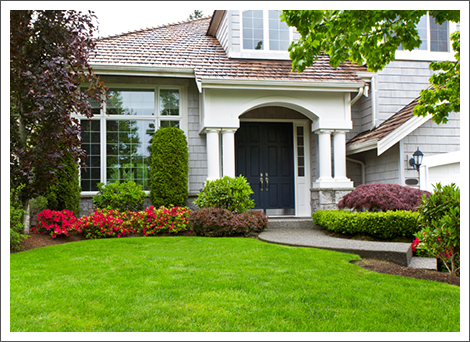 Lawn, Tree and Shrub Treatment- Programs are tailored to each customer’s individual needs. Mowing- Only professionally trained specialists will care for your property. On each visit, the entire property will be mowed, trimmed and all grass clippings blown from sidewalks and streets. Seasonal Color Installation- We offer complete design and installation of beautiful perennials, bulbs and annuals to provide color in your landscape throughout the growing season. Snow Removal and Ice Control- Our dependable fleet offers snow removal and ice control for parking lots, sidewalks and drive aisles. Tree and Shrubbery Pruning- Shrubs are pruned to their natural growing habits. Pruning of lower branches is essential to maintaining better nutritional conditions. This minor pruning ensures adequate sunlight, promoting stronger turf. Verti-Cut and Seeding- Verti-cutting is a process of slicing the soil to provide proper bedding for the seed to germinate. This is specifically recommended for bare and thinning turf areas. Don’t hesitate to call us to schedule an appointment and to get started with our services.